In my further attempt to come up with casual Friday alternatives, I will document the deconstruction of a workday look into after hours casual. 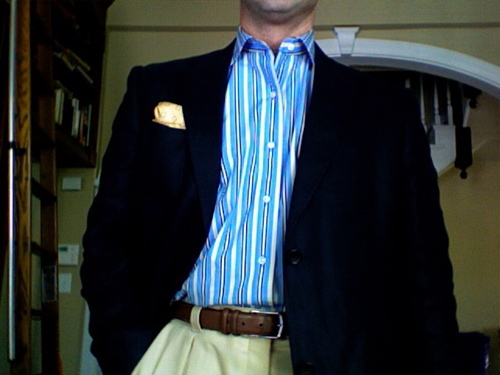 A linen blazer, blue and yellow striped shirt, yellow and grey bow tie, pale yellow super 120’s extremely lightweight tropical wool trousers, yellow and blue patterned pocket square, blue and yellow Panterella socks and cognac penny loafers. I’ve removed the tie. I would also go to cocktails like this. And finally, after the first game of tag with my daughter… the blazer and tie are gone leaving me with a weekend casual look. This is one way to handle the need to have on a tie and still be considered “dressed down” when you need to be. 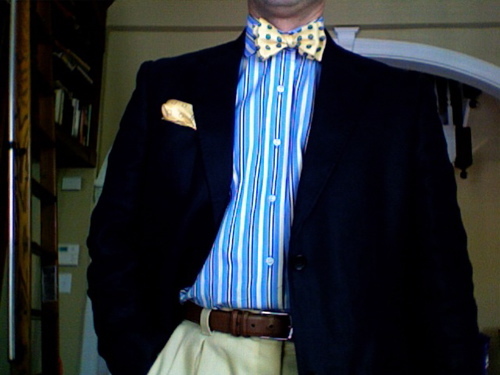 Bow ties are very useful in that you can tuck them into a pocket of your jacket and deploy (or stow) them as needed. In retrospect, I may have substituted poplin trousers or even a pair of linen/cotton jeans in a neutral stone color with driving shoes. Andy Warhol pulled off his look wearing a blue blazer, plaid shirt, black knit tie, jeans and Berluti loafers. Dressed up for an artist, dressed way down for a businessman. But his background was in advertising…. 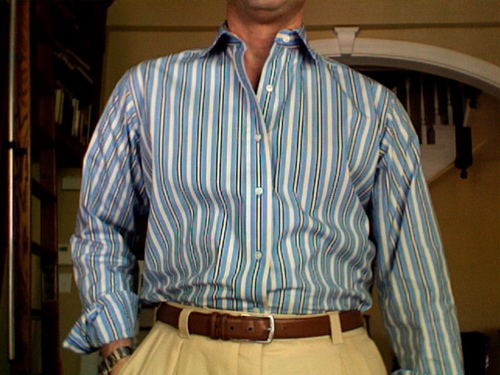 This entry was posted in Cultivating and tagged casual friday, clothing. Bookmark the permalink. Glad that the shirt remained tucked in. The daughter has two small holes in her heart…. I was distracted today. Oh dear, please know that I am thinking about your daughter. Thank you Mrs. PvE. She is forbidden to skydive or SCUBA dive. As she is 3 1/2, I am unconcerned at the present. The doctor isn’t too worried and thinks that it may repair itself. I do hope all is well. I will keep you in my thoughts and prayers. Looking dashing all three ways. I wish I could get my husband to dress so well. (He is still adorable though). Thanks AtB, I’m sure it will all come to nought. BA, keep up hope. It’s a tough battle. But as long as his clothing fits well and is made of good stuff… that’s half of it.